PHILADELPHIA, PA (Laserfiche)—October 18, 2011—Laserfiche (booth #1619) today announced that it will showcase how Laserfiche enterprise content management (ECM) solutions can streamline the admissions, financial aid and accounts payable processes at colleges and universities around the country, including Texas A&M, USC and Oklahoma Christian University. Laserfiche solves business problems across campus, facilitating everything from student records management to facilities management, HR onboarding and disaster recovery planning. “Laserfiche takes a synchronized approach to content management, easing the burden on IT staff while eliminating departmental information silos,” said LaPointe. Laserfiche will be on hand at booth #1619 throughout the event to demonstrate its software solutions for higher education, provide free massages and distribute copies of customer success stories featuring USC and Texas A&M. Laserfiche will also host a reception on Wednesday, October 19, from 6:00 – 8:00 pm ET at the Philadelphia Marriott Downtown. 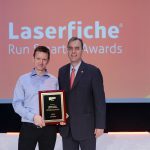 During the reception, Laserfiche will present John Hermes, CTO and Vice President of IT at Oklahoma Christian University, with a Visionary Award for using Laserfiche to streamline processes across campus. Hermes kicked off the Laserfiche project by enabling students to complete and submit financial aid documents through a student portal; next, he’ll implement the system in Admissions and the Business Office. In 2012, he plans to bring the Registrar’s Office and the Office of Student Life onboard. 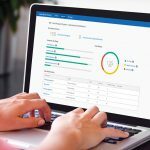 Since 1987, Laserfiche® has used its Run Smarter® philosophy to create simple and elegant enterprise content management (ECM) solutions. Since 1987, more than 30,000 organizations worldwide—including federal, state and local government agencies and institutions of higher education—have used Laserfiche software to streamline document, records and business process management. Laserfiche provides colleges and universities with an ECM solution that can be centrally regulated by the IT department and easily configured for each department’s unique business processes. Schools such as Texas A&M, the University of Southern California (USC) and the University of Utah use Laserfiche to increase collaboration and information sharing between departments, automate core business processes and minimize ongoing maintenance demands for IT personnel.